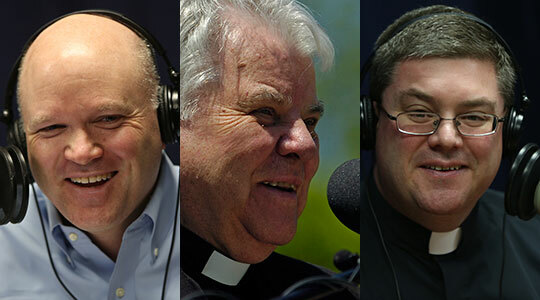 Summary of today’s show: Bishop John D’Arcy, the retired bishop of the Fort Wayne-South Bend diocese and a native son of Boston, died on Sunday after a brief bout with cancer. Scot Landry and Fr. Chris O’Connor discuss the legacy of Bishop D’Arcy, how he lived his life to the full and as a true priest and father, and how he preached his finest homily in how he approached death and the joy he felt in preparing to stand before the Lord. 1st segment: Scot Landry and Fr. Chris O’Connor said today that they will remember and honor Bishop Jophn D’Arcy who died Sunday morning. He was ordained in the Archdiocese of Boston and was an auxiliary bishop here before becoming bishop of Fort Wayne-South Bend, Indiana. Fr. Chris said Bishop D’Arcy was one of the giants among the priests of the archdiocese. Scot said Bishop D’Arcy helped him when he was just starting out in the development office in the archdiocese. He was also one of our first guests on The Good Catholic Life. Fr. Chris said he’d met him once before seeing him again and the bishop remembered his name. He gave some sage advice at St. John’s Seminary: Five good priests will attract 100 seminarians while five bad priests won’t attract anyone. Scot said we’re also keeping in prayer the father of Msgr. James Moroney, Mr. James Moroney, who also died this past weekend, and his family. They discussed how one of the seminarians in his role as deacon had a nearly disastrous accident with the Precious Blood at the funeral Mass, but managed to save the Cup from being spilled. Scot said there was a 30-minute TV special on one of the major TV stations in Fort Wayne last night and we played clips from that show. 2nd segment: Scot said it was only about one month ago around Christmas that Bishop D’Arcy had two new forms of cancer, after having beaten cancer once before. He was 80 years old. He died on February 3, the day after the anniversary of his ordination 56 years ago and on the anniversary of his first Mass. Fr. Chris said the bishop sent a letter to his people in December asking for their prayers that he could meet his end with grace and conviction. Scot said the bishop was ordained in 1957 at 25 years old, which was a young age. He was ordained a bishop at the young age of 42 years old. Scot noted that it shows how well regarded he was by his peers in the archdiocese but also in Rome. Fr. Chris said the bishop was known as a strong spiritual director at the seminary. He spent his first years as a priest at St. Mary’s in Beverly. While he was there for only a short time, the people there still talk about his ministry there. He celebrated his 50th anniversary of his priesthood there and throngs turned out to see him. During the celebration he disappeared for an hour and it turned out he was in the chapel praying before the Blessed Sacrament. At the age of 52, he was named to be bishop of Fort Wayne-South Bend in 1985, helping to grow the diocese and being a dedicated pastor to the people of Indiana. Now another clip from Melissa Long from Channel 21 came to Boston just after Christmas to interview the bishop and his sister, Sr. Anne D’Arcy, his last televised interview. He talked about preparing his parents to die and many of his fellow priests have come to help him die. He said this is one of the great privileges of the priesthood. Scot said what stood out for him was his mention of his love of Christ and that he was looking forward to seeing him soon. Fr. Chris said you hear the faith, conviction, and humility of the man. They noted that the D’Arcy family produced a priest and also a sister, Sr. Anne D’Arcy. Scot said it was clear that one of the reasons that Bishop D’Arcy loved to come back to his childhood home here was to be with his family and to be in his home because he loved them so much. Fr. Chris said Bishop D’Arcy was all about love. It all comes down to love. Now they played another clip from the Melissa Long interview. They noted that he built schools, renovated the cathedral and improved the priesthood. He said he loved the diocese and retirement wasn’t easy. He retired in 2010, giving him time to pray and reflect and return to his ministry as a priest. He had some final words for his diocese. Scot recalled after the death of Pope John Paul II that people said his best homily was teaching us how to die. Bishop D’Arcy’s best homily was his final homily. Fr. Chris said St. Paul wrote that to live is Christ and Bishop D’Arcy illustrated that truth. In the next clip, Bishop D’Arcy spoke about the renovation of the cathedral and how faithful it was to the mission of the cathedral as a place of prayer. Scot noted how much the bishop enjoyed celebrating the Mass in the renovated cathedral dedicated to Our Lady. He was particularly proud that it was a church that everybody liked. Fr. Chris said you can hear the emotion in his voice as he talks because he’s saying goodbye to those he loves. The next clip, he talked about going into retirement, how difficult it was, but how he had time to pray more, to hear confessions, to preach more. Scot said it was clear he loved his priesthood. Many of the listeners were probably confirmed by the bishop. In the next clip, he was asked what message he would like to leave the people of South Bend. He said you have to have joy. You have to pray. You have to forgive. He urged the people of the diocese to be strong in their faith, to be kind to everyone, to focus on the truth. To raise their families in the faith and teach them the beauty of what God has given us in man and woman and family. Fr. Chris noted his call to be joyful and to trust that God loves you. How can you not be joyful if you trust that God loves you? Scot said he became a bigger fan of Bishop D’Arcy a few years ago when the University of Notre Dame decided to invite the most pro-abortion President in US history and he had to implement the US bishops’ decree that Catholic institutions should not give honors to those who are pro-abortion. He decided to explain to the people of South Bend why he couldn’t attend that commencement at Notre Dame. Next we played a clip of Melissa Long’s interview with Bishop D’Arcy in 2009. Scot noted from the interview that Bishop D’Arcy received many letters of support from throughout the country for his decision. On the other hand, the response from his fellow bishops was decidedly mixed. But a month later he sat down for the interview to explain for TV the Church’s position on life issues and to explain why his attendance would have sent all the wrong messages. Fr. Chris said while the graduation was going on, many of the students protested and Bishop D’Arcy went with them to pray with them and commend them for standing up for life. Scot welcomes Bishop John D’Arcy to The Good Catholic Life. Bishop D’Arcy has been a priest for 54 years and next Monday he will return to his first assignment as a priest at St. Mary Star of the Sea in Beverly for a parish mission. He spent 8-1/2 years and it’s where the people taught him what it means to be a priest. It was an extraordinary experience. When he moved onto his next assignment in Rome, he left with a deep appreciation of what it means to be a parish priest. Scot said Bishop D’Arcy’s funeral rites will begin tomorrow. The Fort Wayne-South Bend diocese has two cathedrals, one in Fort Wayne and one in South Bend. Wednesday Feb 6: Reception of the body and Morning Prayer at St. Matthew Cathedral, South Bend, will begin at 10 a.m. Visitation will be held throughout the day. Rosary will begin at 5 p.m. A Mass of Transferral celebrated by Bishop Kevin Rhoades will begin at 7 p.m. The Funeral Mass will be celebrated at noon at the Cathedral of the Immaculate Conception, Fort Wayne. A reception for all will immediately follow at the Grand Wayne Center. Scot said his episcopal motto is “His steadfast love endures forever”, referring to Christ. That exemplifies his many years of episcopal and priestly ministry. Fr. Chris said we pray that Bishop D’Arcy now sees that love face to face and joys that love for all eternity. Thank you for playing parts of the interview that we could not air and for your insightful commentary. Bishop D’Arcy had a profound impact on me and was a heroic person who consistently defended his faith.